Transportation Locks are something that we don’t think about very often, maybe we should. With terrorism high on everyone’s mind it is a different time then it was before 9-11. Think about all the Tractor-Trailer (Semi-Trucks) that are on the road. What are they hauling or what could they haul? What about all the shipping containers that enter the U.S. through our ports? Are they secure? There are two ways to secure trailers and containers: one is by using security tags that are placed on the locking mechanisms and are tracked by serial number or RFID. The other way is to use Cargo Locks and Locking Systems. 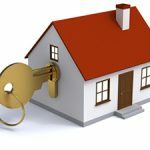 In this Blog I will discuss Transportation Locks. King Pin Lock: This lock secures the “King Pin” on the trailer. Once placed on the King Pin, the trailer is not able to be hooked up to the tractor. The tractor king pin is what connects the trailer to the tractor. Glad Hand Lock: The “Glad Hand” is a coupling device that connects the air supply from the tractor to the trailer. The Gland Hand Lock secures this device so that the trailer cannot be connected to the trailer. 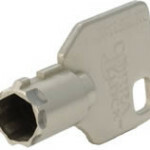 Air Brake Lock: This lock connects to the dash board of the tractor securing the air brake switches. Gear Down Lock: This lock secures the landing gear of the trailer preventing them from being cranked up into driving position. Vertical Door Bars: These locks secure the rear doors of the trailer to prevent them from being opened. Roll Up Locks: These locks secure the roll up doors that are found on some trailers. The above locking systems are only as good as the locks that go with them. All of these devices have some cam lock or padlock. These locks should be high security and patented. This will provide both physical security and key control. Padlocks from Big Box stores are not a high security lock as they don’t offer key control. I have discussed key control in past blogs, briefly, if you can take your key to any store and have it duplicated you DO NOT have key control. Locking Systems Can help you choose the right lock. There is more effort being placed on the security of Trailers and Containers. New style locks have RFID built in. Electronic locks are being deployed. Tracking tags are getting additional electronic tracking capability. GPS devices are being used. No matter what is being used, the rear trailer door should be locked and the trailer should be secured from moving unless authorized. For additional information please contact us at Locking Systems or at LsiDepot. It seems that when we hook up our RV and head out for a week of camping we forget all of the things that keep us safe at our Sticks and Bricks homes and everyday lives. You have to remember that your RV is actually your mobile house. When you arrive at the campground and set it up you are in your house. Most of this “Security” is just common sense stuff that we practice every day. These are just some of the common sense stuff that if you practice your camping experience will be a much safer one. Always keep a watch over your children, know where they are. Most campgrounds have pools or are near lakes or rivers. Never leave them alone near any body of water. Most of this is just stuff that we do every day; however, when we go camping we sometimes forget that all the rules that apply in our everyday lives should also apply when we are camping. RV storage is also something that we should consider. If you store your RV at your house keep it locked. Instead of keeping a window open for air circulation keep a roof vent open. If you store your RV at a storage facility find one that is fenced and has some type of security gate. Security cameras would be a great plus. Again keep your doors and storage compartments locked and a roof vent open. Consider an alarm system with an internal video monitoring system. Many RV’s have sky lights, these are mode of plastic that can be easily cut open. 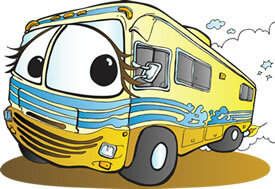 You should go by and check your RV as often as possible. Also consider changing your locks if possible. I am on my fourth RV and all of them use the same key for the storage compartments. This didn’t give me a great sense of security. What is an SB Lock? 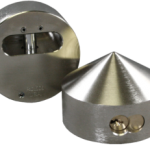 The answer is that an SB Lock (single bitted) is a cam lock available in five different lengths that is used in many different applications. I am going to expand on that definition giving you a clear picture on how versatile the SB lock really is. The name SB Lock stands for “single bitted”. This is where the cuts on the key are only on one side of the key. They are very similar to a standard house key, only smaller. They are available in five different sizes from 3/8” to 1-1/2” in length. Many manufacturers make this type of lock using the standard 54G keyway. Some manufacturers call this lock a utility lock. They are typically used to lock cabinets, desks, tool boxes, utility cabinets and even paper towel dispensers found in rest rooms. These locks are considered low security. If these locks are purchased from Locking System International or our On-Line store LsiDepot, they can be keyed in lots of one to thousands. They are used in applications where the idea is to keep honest people out. These locks are easily defeated and should not be used where higher security is necessary. SB locks internally use wafers instead of locking pins. These wafers are made out of brass and are designed from 0 to 7 which will correspond to the cuts on the key. For example; if wafers 1-3-5-3 are used then the key is also cut at 1-3-5-3. When both match the lock will operate. SB locks from different manufacturers can be mixed and used together as long as they all are on the 54G keyway, which is the most common. Keys from one manufacturer should operate locks from another manufacturer. As a commodity type lock in many cases price is the deciding factor as to where to purchase these locks. Many are made in China where this type of lock have been made for years. The limiting factor in purchasing from China is the quantity. Tens of thousands of SB locks must be ordered at one time. Most manufacturers that use this type of lock purchase them from Companies like Locking Systems International where they can get them in any quantity and get them custom assembled. Contact us at Locking Systems International for large quantities, for smaller quantities, you can purchase anytime at LsiDepot.com. What type of padlock is the “Hockey Puck”? As the name suggests it is shaped like a hockey puck. It is 2-7/8” wide by 1-1/2” thick. It has no visible shackle and is usually made of solid hardened steel. It comes with many types of lock cylinders and security levels. Most manufacturers stick to the basic size and construction materials, with the difference in the lock cylinders. More on this later. A weak point in most padlocks is the shackle, which is the attacking point. Some shackles are cut very easily with bolt cutters. The Hockey Puck padlock was designed to combat this by not having a visible shackle to cut. It has an internal shackle that is operated by the lock cylinder. When the lock is opened it moves down and out, this moves the shackle to an open position. When the lock cylinder is closed or locked the shackle moves to a locked position. In this position the shackle will go through the holes of specially designed hasps. Hasps designed for this type of padlock usually shrouds the padlock so that it can’t get attacked on the sides or get “wrenched”. These hasps are usually made of hardened steel and are designed for a specific application. As I mentioned earlier in this article, the lock cylinder is the major difference between the designs of these padlocks. Most of the hockey puck padlocks are physically secure and very difficult to attack. The cylinder is the factor that makes the difference between the padlocks. As in all types of locks the cylinder defines the security level. To get a high security hockey puck padlock you should look for one that has a patented lock cylinder that provides key control. Most of these padlocks come with a particular lock cylinder and it cannot be changed, so the security level can’t be changed. There is a new style patented hockey puck padlock on the market that allows the end user to change the lock cylinder. This is a unique design in that the end user can purchase a lock for a particular application at a particular security level, if the need arises to go to a higher security level, the end user can very easily change the lock cylinder. This Type of Hockey Puck Padlock is known as the “Universal PUCK Padlock”. Go to LsiDepot to learn more about Hockey Puck Padlocks. Yes, Aluminum and padlocks do go together and Aluminum Padlocks can be secure. You are most likely to see these padlocks in use for what is called lock out padlocks. They would come in multi-colors and lock like a traditional padlock. But what about the Hockey Puck Padlock or PUCK Padlock, these are traditionally made of hardened steel and that will continue. However there are now some Puck padlocks in which the body is made of aluminum. Aluminum has some advantages over steel, weight is one and of course aluminum will not rust, making it ideal for any location where moisture is a problem. The padlock is usually used with a hasp that encircles the padlock giving it added physical security. Although drilling an aluminum lock may seem easy it could be made difficult by placing a few anti drill pins in strategic locations. Also when drilling aluminum the drill bit will tend to clog when drilling a deep hole. The body of these padlocks starts out with solid aluminum billet, they then are milled usually by a very high tech CNC machine. From there either a protective clear coating is added or a color coating is added. Some anti-drill pins would be added, depending on the type of padlock. From this point on the remainder of the padlock is assembled as if it were steel. 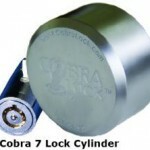 A Cobra Universal Puck padlock made of aluminum could be combined with either an Abloy or Medeco lock cylinder to provide a Aluminum Padlock with high security lock cylinders. 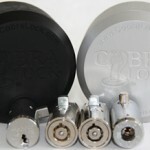 With the Cobra’s patented puck padlock the user can change the lock cylinder depending on where it is being used. If an Abloy lock cylinder was used with the Cobra aluminum body you will have a complete Puck Padlock that will provide extreme environmental protection. You could even have these padlocks made with multiple colors very similar to the lock out type padlocks. With this feature you would be able to segregate your security by color. Also by using a high security lock cylinder you would gain key control. Most high security lock cylinders offer a very high degree of protection from lock picking, so high that most thieves will just walk away rather than try. This would be a way to increase your key security and keep your costs in check. So yes aluminum and padlocks do go together very well and not just for the traditional lock out type padlocks. For additional information about all our products please click here. Garage Door IS Yours Secure ? The Garage Door is probably the most used door in our house. It is also the most abused and could be the least secure door. Garage doors are constructed out of wood or aluminum. Each has its advantages and problems. Wood is the heaviest and the most secure, but it’s the hardest to maintain. Aluminum in comparison is very light and the easiest to maintain. New construction laws require garage doors to be built to the newest hurricane codes, which generally means they must have additional support structures to prevent the door from blowing out during high winds. If this happens the roof of the home could blow off. If you have an older house it might be a good idea to have a garage door professional take a look at it. They will be able to tell you what would be necessary to bring it up to current codes both in terms of the construction of the door and its security. There is also maintenance that should be done to the garage door and the opener. This includes lubrication of the tracks, rollers and the opener chain or screw. You should make sure that all the screws and bolts on the door and opener are tight. Most garage doors have automatic garage door openers, there are three major designs, but they all server the same purpose. When a button is pushed a motor will raise or lower the door. There is a button usually near the door going into the house and of course the remote control which is in your vehicle. When a garage door opener is installed the locking latch is removed. The door is held (locked) by the opener. There is usually an emergency latch that when pulled will release the door from the track so that it can be manually opened. Some of the newer models have battery backups. Can locks be purchased on-line safely? The answer to this question is yes, however, not every on-line merchant will serve you well. You must answer this question, what are you trying to secure and how valuable is that to you? 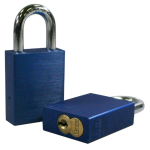 If you need a padlock to lock up a lawnmower shed then buy that padlock from any on-line merchant. If you are securing something valuable like your family by buying front door locks, then you should seek out an on-line merchant that specializes in locks and security. At this point you are not buying a commodity lock you are buying a security solution. LsiDepot should be your first choice to Purchase Locks On-Line. Do they sell only locks and security items? Can you call them and speak to someone knowledgeable in security? Are they authorized by major lock manufacturers? Can they custom build security solutions? Can they sell “High Security” locks? When you view their web site do you see only locks and other security items. Does their web site give you enough information to make a decision? If not can you easily contact them via email or phone? And if you do contact them by phone can you talk to someone that can help you select the correct lock. Are you able to order “Custom Assembled” locks. Custom assembled means assembled to your specifications, such as keyed alike, keyed different or master keyed. Can you order just the quantity of keys that you need. This is a very important part of key control. You should have just the amount you need and the ability to orders more in the future if needed. Can you order “High Security” locks. These have patent protection on the lock and key, that helps prevent unauthorized key duplication. They also are built from high quality material to exact tolerances. And they are built to provide strong physical security. Does this on-line merchant sell quality locks such as; Cobra locks, Abloy locks and Medeco Locks. If they do that is an indication that they are an authorized service center or manufacturer themselves and will be able to provide the proper help and solutions to fit your needs. As I mentioned earlier in the blog and in many blogs in the past, your decision on where to Purchase Locks On-Line and how much to spend comes down to “What are you trying to protect and how valuable is that or they to you”. To Purchase Locks On-Line please go to LsiDepot. What Is A Registered Lock Code? A registered lock code is assigned and registered to a user or company. Only authorized users can order cut keys to a registered lock code. These types of codes are usually used on high security locks as an effort to control access. Our Company will maintain these codes in a custom designed computer database. This database will help to avoid repeated lock codes so once assigned they will never be duplicated or assigned to another user. These types of codes are usually “Blind”. This means that by looking at the registered lock code you will not be able to convert it to a key cut. A lock code chart is needed to convert the code to a key cut that will match the locking pins in the lock and operate it. With many non-registered codes, it is very easy to convert the code to a cut. For many, the code is the cut. This lowers the overall security of the lock as it gives no key control. Key Control is the ability to know how many keys were cut for a lock code and who ordered those keys on what date. Key control and registered lock codes go together. 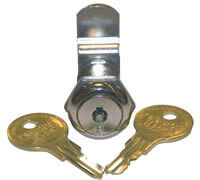 High security locks are usually found at authorized service centers, such as Locking Systems International. They are more expensive than big box store locks, so you first must decide what you are protecting and how much is that worth to you. After making that decision, you will know where to make a purchase. When you purchase a high security lock, registered lock codes are assigned to you. By keeping these codes you will be able to order additional keys later. The number of registered codes you get depends on if you order locks keyed alike, keyed different or master keyed. For example, if you order 10 locks keyed alike you will get one registered lock code. If you order 10 locks keyed different you will receive 10 registered lock codes. I hope this isn’t too confusing. The biggest take away here is that high security locks and registered lock codes go together. Locking Systems International has developed a custom database program that we use to keep track of your lock codes and the users authorized to order additional keys to that code. 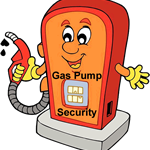 Gas Pump Security – What is Skimming ? If you drive a vehicle your credit or debit card is at risk from Skimming. What can you do and what are the gas pump operators and manufacturers doing to prevent and stop skimming? Skimming is where the bad guys will put a device on the gas pump that will intercept your card number. I will go into where these skimmers are placed. Let’s start with what can you do to help prevent your card number from being stolen. The most important thing you can do is Do Not Use Debit Cards. Once your debit card number is stolen the bad guys can empty your bank accounts. The banks say you are protected, but until they investigate you have no money in your bank account. Before using a gas pump look at it, do you see anything attached to it that looks like it doesn’t belong there? Are all the pump access doors securely locked? Does the store attendant have clear line of sight to the pumps? Are there surveillance cameras pointed at the pumps? If you feel uncomfortable at a gas station or you find one of the above items, then leave and find another station, they are on every corner. Replacing the gas pump locks with stronger and more secure locks, some operators are going with high security cam locks and padlocks. Installing a specially designed box that encases the card reader to prevent access to it. 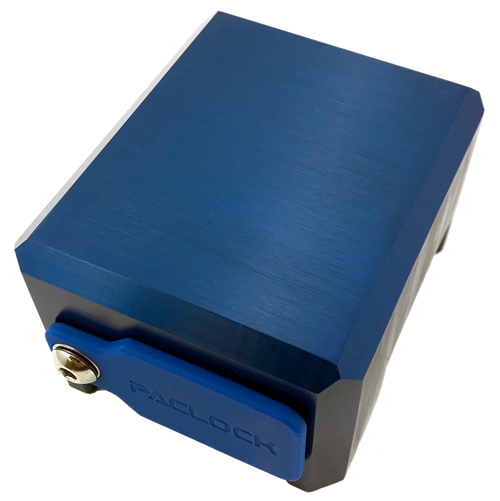 This card reader security box is locked with a special lock that has patented protection on the lock and keys. Installing a special cover, secured by security screws over the gas pump control board. Installing a special security box around the pulser, this device is what counts the gallons of gas dispensed. The card reader manufacturers are also increasing the security of the reader itself. Many gas stations are requiring that you input the zip code that matches the credit card. When credit cards with a chip imbedded becomes mainstream many credit and debit card problems will go away. For additional information visit us at LsiDepot.com. Deadbolt Lock – How to Choose!! Most people know what a Deadbolt Lock is, but be careful because not all deadbolt locks are created equal. There are differences and these differences could mean preventing someone from breaking into your home. I am going to give you the information you need to make an informed decision when you purchase a deadbolt lock. The locking bolt should be at least 1” in length (past the door edge). This will prevent prying the door open. The locking bolt should be made out of solid steel with a hardened steel insert. This will prevent someone from sawing the locking bolt. There should be a “Free Spinning” guard around the outside of the lock. This prevents someone from using a wrench to turn the deadbolt lock. The inner lock mechanism should be protected by a steel shroud. This shroud goes over the mechanism and between the outer and inner door. Choose a high security lock cylinder. This will prevent lock picking. Metal strike with 2.5” to 3” bolts. The metal strike fits on the door jamb; this is what the locking bolt protrudes into. The 2.5” to 3” bolts are very important; you want these to screw into the door jamb, then into the supporting frame that supports the door jamb. Some of the other questions will be color and finish. Make sure that the finish is weather resistant; this will prevent the lock from losing its color and finish. Also, do you want all the locks to be keyed alike? This is where one key will open all your locks. Keying questions can be answered by our Lock Experts. I don’t think that I could discuss deadbolt locks without mentioning the door itself. You could buy the best deadbolt lock, but if the door that it mounts on is inferior, you will have no security. The door should be solid, meaning solid wood, steel or fiberglass. A wood door should have no rotten areas and a steel door should have no rust. The door jamb should be solid and it should be supported by a solid frame. To properly secure your home, every exterior door should have a good quality deadbolt lock. Locking Systems can help you choose the Right Deadbolt Lock for your home or business.